I'm excited to be sharing with you my newest free crochet pattern! I've named it the Long and Short Scarf and shared a little bit about my thoughts on the Scheepjes Secret Garden yarn* here. 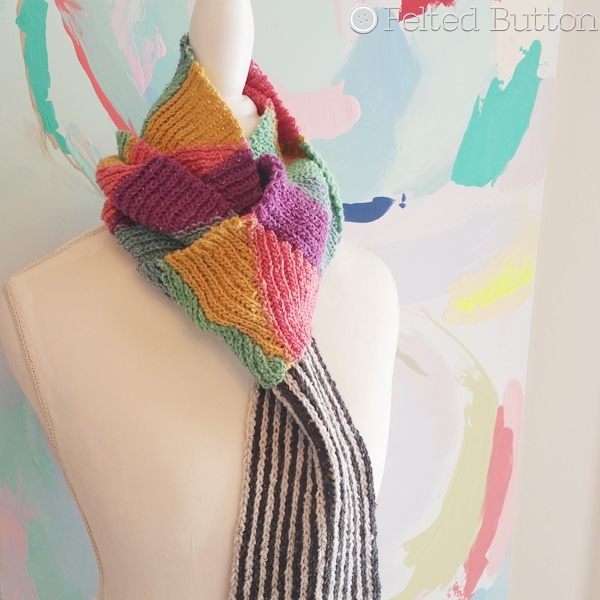 As I mentioned in the previous post, I named it this because it is worked in short rows--but is a long scarf that is whimsical and versatile to wear. 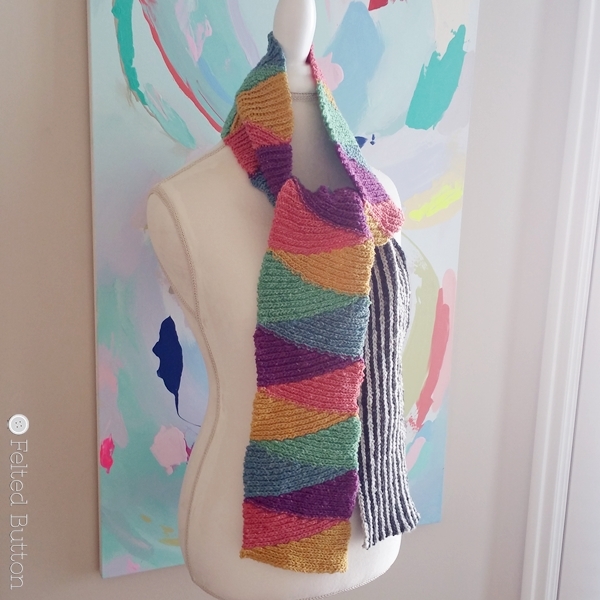 It's easy enough to adjust the length of the scarf by reducing the number of colored repeats, colors, or length of striped section. In other words, the pattern is super versatile, too. 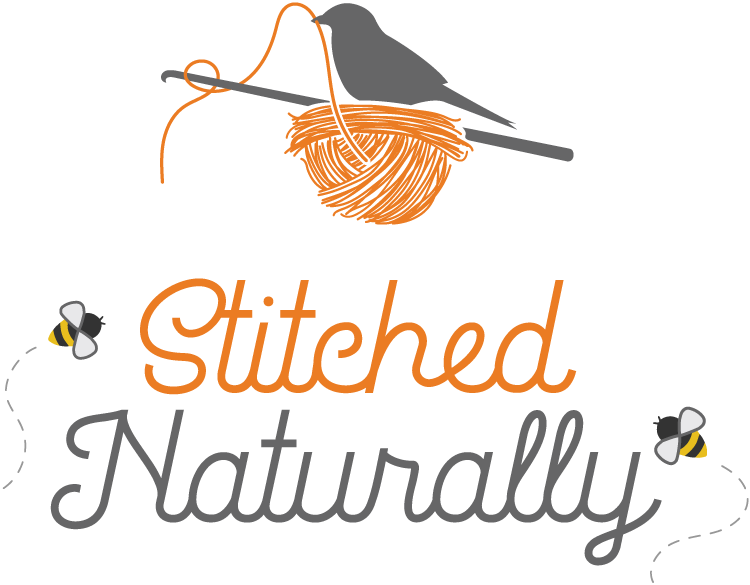 If you have never worked short rows or slip stitch crochet, this is a splendid piece that works up fairly quickly and easily to give you some practice. Let's get going on the pattern (below), but if you are interested in a tidy pdf version for $2, you can find it in my Ravelry shop here. You can also find links to purchase the yarn here. 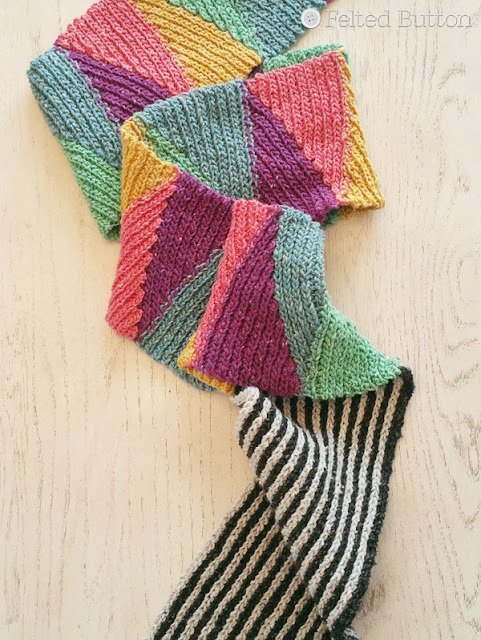 Remember, you can easily adjust the length of your scarf by working fewer repeats of the angled section--either fewer colors or fewer times through the sequence--or make the striped section shorter. 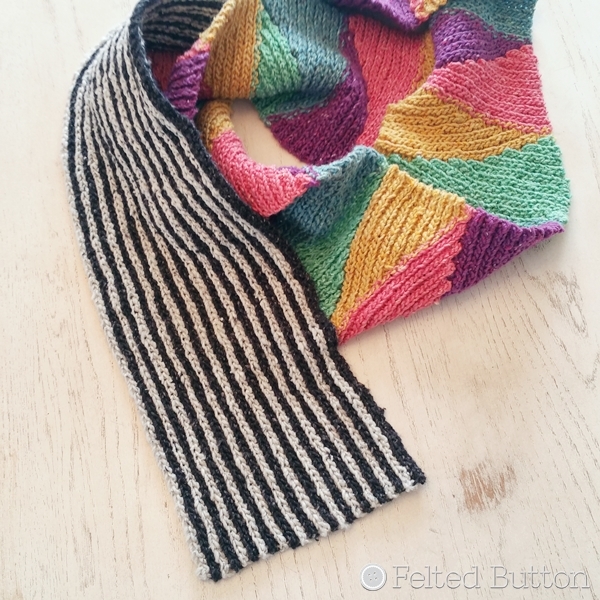 You can also adjust the width of your scarf by working fewer or more repeats of 3 + 1 for your foundation chain. The color sequence for the angled short-row section is A-E (Rows 2-20) repeated 6 times, ending on Row 19. The color sequence for the striped section is F-G, repeated 12 times. Ch 1 at the beginning of a row does NOT count as a st. Right side and wrong side are not critical to keep track of until you get to the striped section since both sides look essentially the same. Tip: If you have a tough time determining the last st of each row, place a marker in it after working it. See the X's? Those are the back bumps on the wrong side of the chain. Stick your hook in there when working Row 1. Also--remember to work LOOSELY! If you pull those slip stitches too tightly you won't be able to get your hook back in them on the returning row. Think relaxing thoughts! This is what Row 1 looks like complete. Notice that it looks like a chain sitting atop another chain. And remember, when you turn it to work Row 2, the sl sts will tip away from you--so the back loop will be tipped towards the back of your work. When working Row 3 or its repeats, you will always work in each st back to the straight edge. Notice you now have a "step" at the other end of the row. Above is what your piece will look like at the end of Row 18. You now have 10 "steps" --with each "step" made from 3 stitches. For this row you are essentially working down the "steps"--3 sts for each "step". This shows the first 3 sl sts worked. Now work your next 3 down on the next "step". Continue working 3 stitches on each step to the end (3 sts X 10 steps = 30 sts) as shown above and then turn your work. Working a Row 2 repeat, slip stitch back up the "steps" to the top of the hill leaving the last 3 stitches unworked. You'll repeat these rows (2-20) until you've repeated your color sequence (A-E) 6 times (or as many times as you wish). But, remember to end your final time through the repeat on Row 19 before fastening off. Note: This is a good place to adjust the length of your scarf if you wish. Chain as many or as few as you want here. You can also avoid weaving ends by not fastening off between rows and just dropping the old color and picking up the new color. 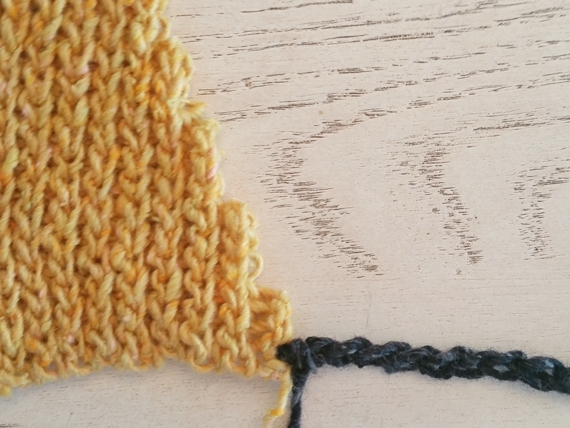 Draw through the new color on your last draw through of the final slip stitch of the row. 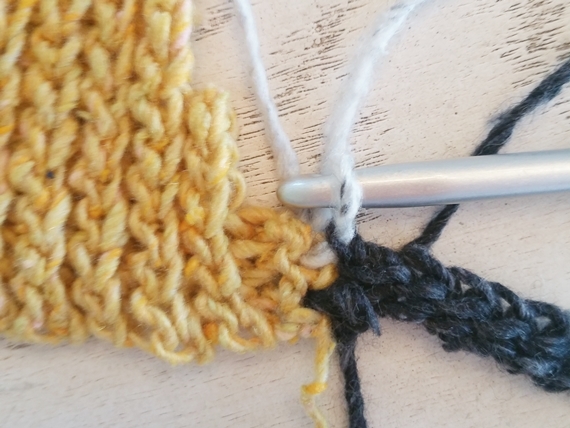 Shows color change to G. Drop F and slip stitch in next stitch of "step" drawing through G.
Rep Rows 2-5 across width of scarf ending with Row 3 repeat. Fasten off and weave in ends. I hope you like the scarf. It's fun to wear, has a unique graphic feel and is comfy around the neck. Until next time...follow me around on Facebook here, Instagram here, or Pinterest here. 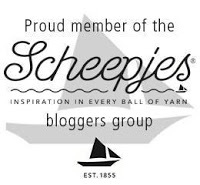 *This post contains affiliate links which if used do not cost you more but might provide me a small fee and allow me to keep the blog and free patterns coming. Gorgeous! You come up with such wonderful patterns. Thank you, as always, Sangeetha! You are so very sweet! So let's say I want to work the entire scarf in the triangles. How would I finish off with a straight edge on the other end of the scarf? I'm not certain, but a little playing with it might get you there. I suppose you could work your last color change without skipping the last 3 on each row until things are square. Wonderful! I would love to know how it goes for you. Feel free to share on my Facebook page or pm me there, if you need anything. Me encanta tu blog!!! acabo de descubrirlo y estoy muy entusiasmada. Tus explicaciones son muy claras asi es que tengo que intentar algunos de tus trabajos.Gracias desde San Juan-Argentina! Thanks, Rita! I'm so happy that you found me. There is a lot of fun crocheting going on around the world. And I love that we can connect through such a craft as this even though we are so far away from each other!